As the summer wears on, many homeowners lose enthusiasm for proper lawn care. The heat and stress of the summer months can take a toll on turfgrass in the Midlands. Many people begin to think that itâ€™s too late to do anything about it, and letâ€™s be honestâ€¦ most of us have little interest in doing yard work in the summer heat and humidity of Columbia, SC. Neglect only does more harm to the lawn, causing it to look even worse and a sense of futility to grow. What many people do not realize is that a good late season lawn care program will greatly enhance the health and appearance of your lawn throughout the fall and in the spring, when warm season lawns come out of dormancy. Many people ask, â€œWhen is the best time to start a good lawn care program?â€ The answer is, now! It is never too late to start caring for your lawn. As football season is upon us, it is time to kick off your fall lawn care program. Late summer through fall is an important time to address your lawnâ€™s fertility needs and to get ahead of lawn disease and broadleaf weeds that compete with your grass. Providing your grass with the right amount and type of fertilizer is very important as fall approaches. Choosing the correct amount and type of fertilizer depends on your soil and grass type. Generally, fertilizers that provide less nitrogen and more potassium and iron are best for late season lawn care. Potassium will help enhance your lawnâ€™s cold hardiness during the winter, and iron will help to promote good green color during the late summer and early fall. It is important to not over-apply nitrogen late in the season, as this will push shoot growth of your grass, making it more susceptible to cold injury and disease. Also, excess nitrogen in the soil during the cooler months only feeds winter weeds, which can compete with your grass for water, light and nutrients. Broadleaf weed control is another integral part of a good fall lawn care program. Using post-emergent herbicides to clean-up weeds that have emerged in your lawn in the late summer will relieve some of the stress on your grass. It is also important to apply a pre-emergent herbicide in the fall. This will help keep cool-season weeds from establishing themselves as your grass goes dormant for the winter. Another problem that plagues many warm season lawns in the fall is lawn disease. Fall is the best time of year to apply curative and preventative fungicides to protect your lawn from diseases like large patch and leaf spot. It is also important to apply fungicides in early spring, however getting ahead of lawn disease in the fall, before it becomes a big problem is best. In addition to your lawnâ€™s fertility, disease and weed control program, there are some cultural practices you can implement that will help enhance the health and appearance of your lawn this fall, and get it off to a great start next spring. This includes things such as proper mowing, watering and good lawn maintenance. Make sure you lawn gets plenty of sunlight. By keeping leaves and debris cleaned off the lawn and selectively pruning tree limbs where necessary, your lawn will photosynthesize more efficiently, and produce the carbohydrates needed for increased cold tolerance and a healthier turf next spring. Also, be sure to raise your mower height in late summer. This will promote deeper and healthier roots, reduce weed seed germination and provide your turf with those carbohydrates to get it through the colder months. Keep these tips in mind, and remember that late summer through early fall is a great time to start your lawn on a Carolina Vistas Lawn Care program! 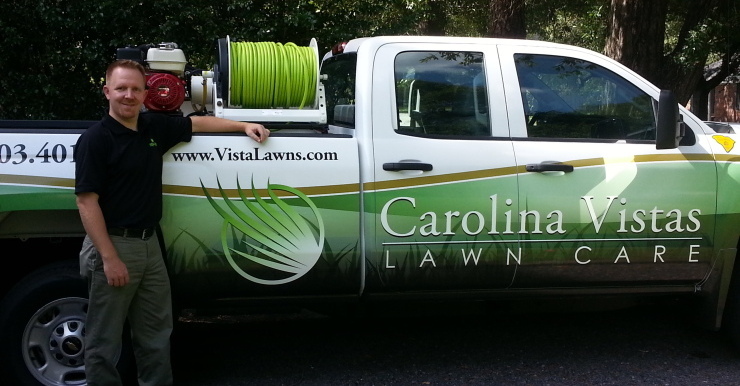 We are locally owned and operated, and our programs are designed specifically for lawns in South Carolinaâ€™s midlands. A Carolina Vistas program will help your lawn recover from the stresses of the hot southern summer, and get it off to a great start next spring!